On Saturday eventing, August 6, 2016 during the 2016 FAPA President’s Book Awards ceremony in Lake Buena Vista, Florida, Mark Wayne Adams received the 2016 Florida Authors & Publishers Association Founders Award. This achievement award recognizes a longstanding FAPA member for contributions to FAPA, the publishing community, the reading community, and professionally published books. Thank you Terri Gerrell for allowing me enough time to prepare an acceptance speech. I actually prepared two—a short and long version. Unfortunately, I lost the short version. Receiving the 2016 FAPA Founders Award is a tremendous honor. When Terri told me I had been selected, I asked myself, why me? I know many deserving individuals, most of which are here tonight. I began publishing in 2004—33 years old. Craig Winstead, employer and friend, inspired me with these words: “I’ll print your book for free, if you learn to publish it.” Within a month I had purchased a block of ISBNs; registered an LCCN; bought a barcode; and printed 5,000 copies of my first book, Miss Mary’s Missing Book Bag. Printing books isn’t publishing. Selling books is publishing. The first publishing lesson I learned was, if you don’t sell books they get heavier. My family, those books, and I moved four times between 2004 and 2006. I became a stronger and wiser publisher in no time. In 2009, Nicholas, That’s Ridiculous! A Story About Being a Boy released. It was not only Christa Carpenter’s first book, but also the first book I published for anyone besides myself. Nicholas won an IPPY, an Eric Hoffer, a Moonbeam, and a FPA President’s Book Award! Elated by my four-medal publishing success, I joined not only FPA, but also the board. I learned book awards lead to unexpected opportunities and a surge of confidence. From 2009 to 2016, I served in various FPA and FAPA leadership roles—president being one. I thought, what can I do differently from my predecessors? I proposed ridiculous ideas, that if they failed, would make me famous: Mark Wayne Adams leader of FAPA’s demise! With many of the current FAPA board members’ support, we doubled the book awards submissions; added national librarian judges; attended Book Expo America; and hosted the largest conference and book awards since FPA’s inception. This was a great honor for our board’s commitment. During this time we learned the real definitions of: donating time, working board members, and delegation. In mid June 2016, I was invited to speak at my first American Library Association Conference. Dr. Anna Faktorovich, a Ph.D in English Literature and Criticism, email queried ALA speakers for blog interviews. When she discovered I wasn’t her traditional academic guest, my interview was declined. One week later I tossed drawings on the ALA convention floor. A young woman, carrying an armload of books, marched down the drawing path. She quickly apologized for stepping on my art. “No worries, it’s only paper!” I said. After visiting over a million elementary school students, hearing my name shouted isn’t strange. The six degrees of Mark Wayne Adams story that follows is strange. Anna shouting my rejection publicly wouldn’t sell books. However, my ability to “draw her into my world” filled Anna with a barrage of publishing questions. I finally said “Anna, I’m working. Send me your interview questions, if you want answers.” She agreed and asked for a review copy of my latest book. I handed her my first novel. Countless hours went into researching and revising the manuscript for this moment—a review by a Ph.D. in English Literature and Criticism. In my twelve-year publishing career I’ve learned that rejection, criticism, and affirmation are all the same—feedback. How I choose to use feedback defines my professional success. Feedback from my publishing peers, beta readers, editor, and a group of national librarians, made today a founding moment. I can now say OUTBACK: Bothers & Sinisters is my first award-winning novel. At last year’s awards I shared: we all have one person responsible for inspiring our publishing career. As Diane Harper accepted her first of several book awards, she whispered, “Mark, you’re my one!” She was the first of many that night to repeat those words. I met Fast Freddy long before I met his creator at the FAPA and Readers’ Favorite book awards. One year ago, author Lee Ann Mancini reluctantly confessed she hadn’t sold any of her award-winning books. She recently posted on Twitter, “450 off to LifeWay book stores!” What a Bragger! Lee Ann Mancini. Jane R. Wood has gone from visiting schools, a niche market for authors; to publishing the book, teaching others to succeed. She is also the first author I know to sell over 6,000 books in one day! Having your first stalker sound likes Misery, but Patti Brassard-Jefferson went from stalking me for StuPendous publishing tips to being featured in Publishers Weekly for her indie bookstore, PBJ Boox. Indie authors and publishers are now her stalkers—I’m her biggest fan! Like I said there are many people more deserving of this award. Before I close, I’d like to thank my family: my beautiful wife, Angela; my overly talented daughter, Isabella; and my handsome giant son, Carter; you all keep my ego in check. Thank you to my author family: Christa Carpenter Blaney, Linda Smigaj, Eddie Price, Irina Dolinskiy, John Hope, Kay Whitehouse, and many other talented authors who ignite my imagination. Thank you also to my FAPA family, who work equally as hard to support others as they do me. You’ve shown me the Founders Award is not about being first but placing others first and contributing to their success. Now’s the part where I ask you for something. I’ve always looked to you as a mentor, and your advice has never steered me in anything, but the right direction. Our past conversations have always challenged and rewarded me on a professional level and personally as a growing artist. I was hoping pick your brain about making the transition into more full-time freelancing career. I would like to chat about the things I should be thinking of and taking into consideration, as well as checkpoints, I should be looking for to guide my decision to make this planned transition meaningful and effective. #1. Understand your value before becoming a freelancer. Remove freelance artist from your vocabulary! Professional Illustrators, Graphic Designers, even Sandwich-makers have added value. Clients respect the word “pro” far more than the word “free.” Professionals in any career require a basic income to exist: bread, water, cell phone, etc. Some professionals desire a more comfortable existence: reliable car, home, etc., while others choose a lifestyle: brand names, travel, etc. No matter your professional classification, define the value of your time with a desired monetary outcome. #2. Develop multiple income streams. Yes, don’t quit the day job yet. For aspiring illustrators, the day job and illustration contracts are multiple income streams. If balancing these two isn’t possible, a full-time illustration career may not be for you. Transitioning from Art Director, a 40-60 hour week at base salary, to “freelance” illustrator was double the work. Believe me, I was that guy. Now as a professional illustrator, most people assume I have one job—not true. I’m an illustrator, author, publisher, graphic designer, and public speaker. My annual income fluctuates between several income streams. For my transition roadmap, I concentrated my time in one area of illustration—picture books. My reason was, do something fun that you’ll enjoy after working all day. I committed to watercoloring one page a day for two hours. This commitment allowed me to illustrate a picture book every 30 days, if I wanted. Below is how I mapped out the income for the transition. Estimated Annual Income: $69,000–$75,000 for 355, 8-hour work days, which included 120, 2-hour nights. Estimated Income: $73,000–$87,500 for 355, 8-hour work days, which included 120, 2-hour nights. Plus, 5 days vacation were allocated to public speaking. By the end of the second year, the day job salary of $45,000 (355, 8 hour work days) was matched with my Professional Illustrator income of $30,500–$40,000 (120, 2-hour nights and 5, 6-hour days speaking). Note: My Professional Illustrator’s income was created through multiple income streams: contracts, royalties, and speaking. Estimated Income: $57,000–$79,000 (for 210 days of work). Note: This income was pretax, and based on my timely completion of projects, hence professional. #3. Don’t quit the day job until asked or all debt has been paid in full. Two incomes are better than one—ask my wife. With the additional income from illustrating, pay off or down debt while saving six months salary. After quitting the day job, deadlines become less demanding and laziness takes over. Minimal debt and a financial buffer are necessities during any transition. Marriage wasn’t a reliable financial buffer—ask my divorced friends. Once the transition was complete, I had 155 vacation days! I dedicated 100 days to new projects that generated income or enhanced my professional skills. This left me with 55 vacation days, enough to make previous co-workers and family envious. I attribute my decade of success to understanding the value of my time, maintaining multiple income streams, and working through my potential laziness. The above formula remains my roadmap for transition and maintaining a professional illustration career. Be selective with projects and be selective with clients. The pitch has been made though a previous meeting. The potential client’s contact information was received. Now what? Continue the momentum through prompt follow up! We meet (where?) at Book Expo America (when?) two days ago. I was (who?) the somewhat funny illustrator. Your (what?) book about fairies sounds exciting. (why?) We can create a profitable story using both our talents. (how?) My contact information is listed below. Our meeting was brief. Did you have any additional questions? Follow up one week later with an email that reminds the contact of your first email and ends with, “please kindly respond upon receipt.” They will feel obligated to respond or end the discussion. FAQ’s Section Reduce email time by creating daft emails with answers to frequently asked questions. Give correct information. If the information isn’t readily available, don’t make something up. Kindly respond, “Great question! I will research this topic and get back with you shortly.” This builds credibility and doesn’t cause frustration. Mr. Smith do you come from a large family? I bet the Smith children love to read your stories! I bet you use your talent in your occupation. What does your employer think of your writing? I run for fun. What would Mr. Smith do for recreation? I noticed you like sports Mr. Smith, do you play? I bet working for your company is financially rewarding. If money were not an issue, what are 5 things you’d do for free Mr. Smith? Determine a deadline on the third email. Determine when a client wants to release their book. If the project is six months from starting, kindly email the client once every other month. Keep the enthusiasm you’ve created in the first email. 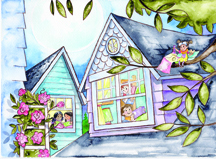 Offer your windows of illustration opportunities. If a project is not of interest, give clients a referral to a trusted illustrator. Be in control of time. Don’t chase a contact! If there has been no communication, file the contact as tentative. There are hundreds of other authors willing to make illustrating easy. This quote is worst case scenario before I review a project. As a professional, I request to read the story, require a basic marketing plan, and the budget. Then I quote an illustration project accurately using the Graphic Artist’s Guild Handbook of Pricing and Ethical Guidelines. Project price depends on the number of illustrations required not page count. If a book has a spread, one illustration spanning 2 pages, it’s considered one illustration. Therefore a 32 page book may only require 16 illustrations. The book may be 32 pages, however the illustrations don’t equal the page count. This is why my friends and I may be the inexpensive illustrators you’re seeking. Illustrators I would refer are: Mike Woodcock, Christopher Epling, and Steve Riley. I know other illustrators, however the illustrators I listed work within similar pricing. Writing is a revision process. The illustration process is no different. Don’t feel overwhelmed by “the approval process” of illustrations. Your approval is the green light for an illustrator to dedicate time into a final masterpiece. Written input from authors and publishers allows illustrators to adjust images at various stages. Below is a basic layout sketch. These layout sketches are done quickly and require minimal time and cost. From thumbnails to the final illustrations, each is generally scanned, manipulated, and sent for review. This dedicated time is beyond the illustration process. Provide clear written direction for each page to avoid back and forth with the illustrator. This layout sketch is basic, no facial expressions and a general feel of the scene. Storyboarding may come to mind. Notes for this page were: Have the fairy eating a snack and reading a map, possibly on the roof or a branch. Show children reading books and make the moon glow. Based on the “Layout Sketch Approval” This pencil sketch is updated with specific details on watercolor paper. 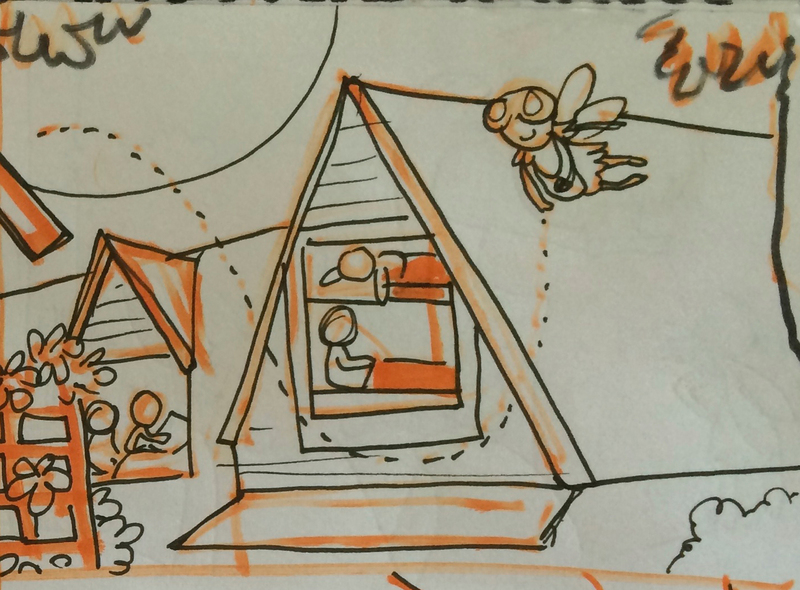 Houses have siding, roses climb a trellis, and a fairy is resting on a branch reading a map. New details add dimension; however, the drawing isn’t 100%. A lightly sketched pencil image still fills the page. Notes for the pencil sketch adjustments were: Add a flashlight. Make the children happy. Watercolor pencil is used in this book. Other books use either a detailed pencil or pen and ink drawing before colorizing the final illustration. This line illustration shows crisp details unlike the pencil sketch. In this process some notes are eliminated but will appear in the color illustration. For example: Notice how the moon was eliminated from the illustration. This is done because the moon is added during the watercolor stage along with other details. Sometimes line illustrations are converted to coloring sheets or activity pages. Communicate with your illustrator before the art is colorized, if you require coloring pages. Also note, not all illustration contracts allow the reproduction of line illustrations. Most contracts only allow reproductions of the final illustrations. Four approvals later, the color illustration is complete. The moon is glowing and the once flat lined illustration now has depth. As you can see, the author’s and publisher’s input is needed not once but four or more times per illustration. A 32 page picture book is a fun and complicated labor of love. Created by a team for with readers in mind. I use this approval process to illustrate books my clients envision. Every graphic artist is unique. No two illustration projects are the same. Use the Graphic Artist’s Guild Handbook of Pricing and Ethical Guidelines to set pricing guidelines for your business. Authors, Art Directors, and Publishers can use this book to budget projects.